"Let me count the ways"…that my knees have hurt and have sidelined me for weeks or months at a time over the decades. And let me tell you how myofascial release (MFR) has vastly improved my knee health. MFR of the side of the hip aids the ITB (illiotibial band) on the outer thigh & therefore the knees. I’ve had knee pain since I was 20 years old. In my mid-30’s my chronic, hobbling, problems were diagnosed as lateral compression of the patella (knee cap) and roughness under the patella, which meant my kneecaps were misaligned so as to make the boney parts of the knee too close to each other. The misalignment was made worse by the roughness, resulting in chronic swelling. The fix was to bulk my quadriceps (front thigh muscles) so they would literally lift the knee cap a smidgen, making the knee joint a tiny bit roomier. The strategy helped and has been my virtual coach demanding that I be very active ever since. If I go 3 days without a quad-bulking workout, my risk of knee pain shoots up. The prescribed leg lifts with weights didn’t come close to giving me the bulging quads that I needed, hence endurance activities like steep hiking and long-distance cycling came to the rescue. Keeping my quads big was my first major intervention for having happier knees, though it wasn’t enough to prevent all of the swelling and pain. 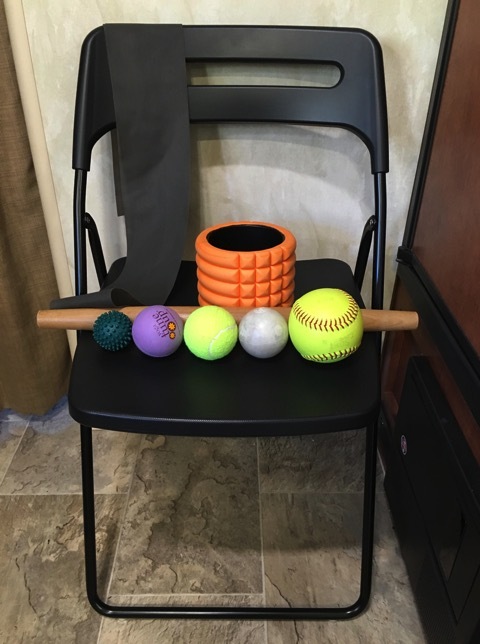 The basic strategy of MFR is simple: put an object like a foam roller, softball or lacrosse ball on the floor, rest an area of knotted muscle tissue or fascial density on the object, and then apply as much of your body weight as you can tolerate on the object to entice the density to break-up or soften. If you have issues in your tissues, they will immediately reveal themselves to you as lumps, bumps, and ropes that cause pain when pressed on, perhaps excruciating pain. If the tissues are free of ‘accumulations’, they will feel smooth and the pressure will be a non-event. This is what makes MFR so appealing, so simple. You don’t need to know any anatomy, you don’t need to understand the details, you only seek out painful spots and treat them with pressure that you control. Supporting my upper body increased my stamina for especially painful shin smashing with a Yoga Tune-Up ball. I invested about $60 in a book, a foam roller, and assorted balls and devoted over a 100 hours of my time over 4 months to MFR and was convinced that I could master my knee self-care though the work wasn’t completed. During those 4 months, my hiking speed shot-up and my knee irritation diminished to a whisper. Over the years, I’ve spent thousands of dollars and hundreds of hours on my other big intervention, sports massage. Massage is a huge help and was essential for keeping me active but amazingly, didn’t achieve the deeper repair to injured tissues that I’ve accomplished with MFR. Likewise, the thousands of hours I spent attending rigorous yoga classes didn’t unravel all of my challenges. In addition to fixing my knees, I’ve eliminated the need for chiropractic adjustments to my foot, ankle, back, and neck and resolved a shoulder limitation with MFR. I stand and move with less effort and feel more comfortable in my body since incorporating MFR into my daily self-care routine. 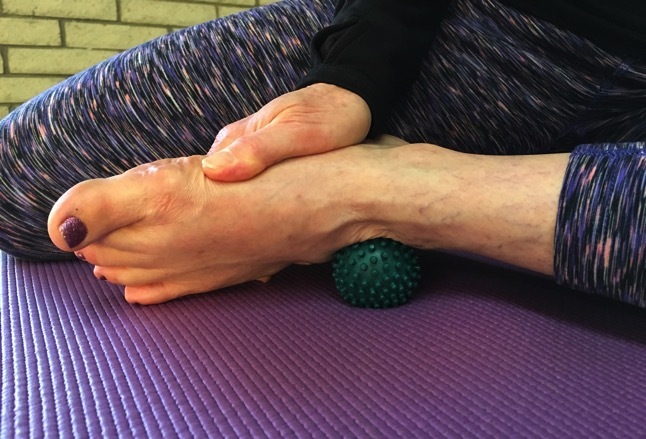 I suspect that almost everyone can benefit from doing myofascial release on the uncomfortable parts of their bodies even if only “cleaning up” irritation that is secondary to an ongoing problem. I believe my knee joints are fully intact even though they are a bit rough and catawampus. I also believe that my usual sources of pain and restriction are due to knots and kinks in muscle, fascia (connective tissue), and scar tissue and feel confident that I can do no harm to them with myofascial release. If however you have ruptured, torn, or worn-away parts in your knees, I’d recommend a frank discussion with a knowledgable health care professional before proceeding. Some people have knee joints that are literally held together by a thread and lengthening that thread might permanently destabilize the joint. I’d also seek professional clearance if you have had knee surgery. Avoid working directly on bones until you have developed your own sense of which pain is therapeutic and which is not. I only use the relatively soft Yoga Tune-Up ball or a tennis ball on boney areas like my shins. I’m not a licensed or certified anything. All of what I am sharing is based on what I’ve learned through experimenting on my own body and a bit of reading. Let your own body wisdom guide you as mine has me. Our favorite smashing & distraction tools. Every patch of abnormal soft tissue is different. I’ve found a couple of hot spots that I completely cleaned up in 3 days with 5-10 minutes of work a day. I had an immediate and welcome restoration of range of motion and sensed no need for further work even after testing the areas with a ball several times over the next couple of weeks. In contrast, residue from a forty-year-old ankle sprain that dramatically improved after the first MFR session still benefits from some focused work 4 months on. I assume that I quickly broke-up the scar tissue around the original injury, a small muscle, and that much of the subsequent work has been on the web of fascia in the lower leg and foot that’s been distorted by the chronic injury. 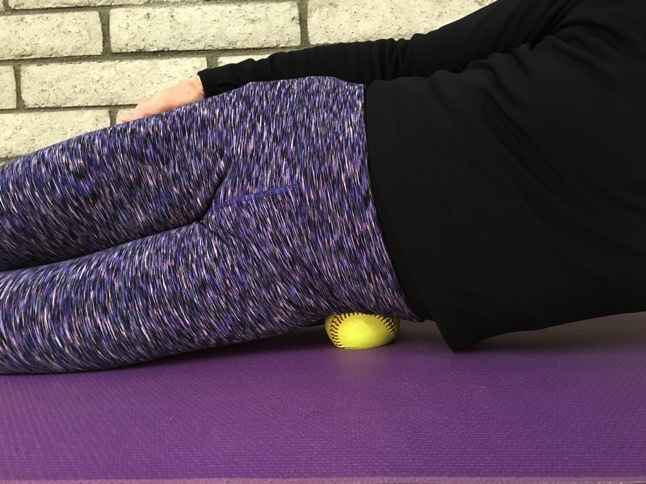 Dropping the foot lower puts more weight into the ball for a deeper release of the inner thigh muscles (working from the floor, use a softball on top of a book). The irony of “working on my knees” is that I don’t ever actually work on the knee joint but instead, work on almost all of the soft tissue from my ankles to just below my waist. Despite dire diagnoses like “degenerative meniscal tear,” I’ve held my breathe hoping my issues were all muscle and fascia, that my 40+ years of knee pain has primarily been due to imbalances in the soft tissue. I assume there has been a domino effect from a series of shortenings, tugs, and pulls in the muscles and fascia throughout my lower body, some of them ancient, and subsequent inflammation that constantly irritates my knees. My hope for years has been that if I could unravel these accumulations of trauma and micro-trauma in my muscles and fascia that I would have happy knees. Of course, because of my underlying structural issues in the joint, I will still need to maintain bulky quads but MFR seems to be proving me right about the soft tissue origins of my knee discomfort. 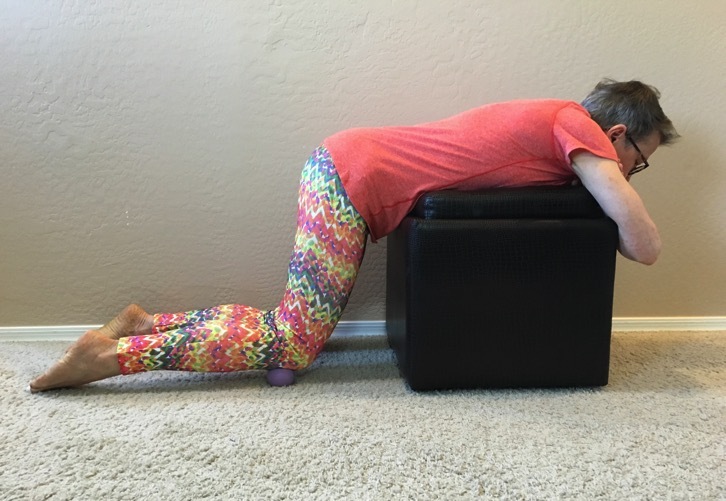 Myofascial release, or “smashing” as the author Kelly Starrett calls it, is very painful on tissues in need of help to heal but the pain will instantly stop the moment you remove the pressure. In addition to being painful, it is slow, tedious work. I‘ve spent 1-3 hours a day about 6 days a week for 4 months primarily focusing on fixing my knees and I’m still finding new hot spots even though my knees are vastly more comfortable and resilient. Using a Trigger Point roller on the front thigh muscles. I get discouraged with almost every project area I undertake. I become impatient with the pain; I believe it won’t ever release; and I resent the time it takes. I take a couple of deep breaths, set the whining aside, and (literally) press-on, perhaps moving to a new area. It takes a horrific amount of time but the MFR always prevails—I always get improvement. And most hours of the day when I’m not actually doing MFR, I’m beaming with delight because I've renovated my tissues in a way that no body arts practitioner has ever been able to do. Delve into the general topic of myofascial release by reading my introductory piece on the subject, reading the first 100 pages or so of Starrett’s book, or reading about the subject online, then dive in. 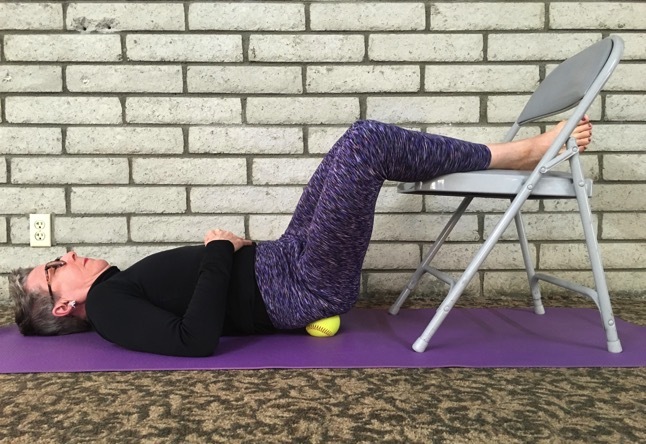 Lying on your belly on the floor, place a foam or Trigger Point roller under one thigh, padding your forearms, feet, and other knee as needed to be comfortable. I now also elevate my chest with a zafu, which is a very firm meditation pillow, to be more relaxed. Slowly roll the full length of one thigh from just above the knee cap to just above where your hip bends. Most of the muscle mass at and above the hip joint will be towards the outer thigh up to the hip bone. I find it easiest to work a 4-6” length of quad tissue at a time, working across from the inner to outer thigh, or reverse, then moving on up to the next section of the length of the thigh muscles. When you find a lumpy spot, change the angle of the roller on the tissue to tackle it a little bit sideways and then apply steady pressure to it for 20 seconds. The 4 big quad muscles run lengthwise of the thigh and you may sense their vertical orientation as you explore the muscles with pressure. A 5th, very powerful front thigh muscle is the Sartorius and one of its ends attaches to the outer hip bone above where the leg bends at the hip and the other end attaches below the knee on the inside surface of the lower leg. Releasing the difficult-to-access inside of the knee muscle attachments on both the upper & lower leg. You may feel lumps and bumps in the Sartorius when working the length of the thigh or you might be able to trace its diagonal path from the upper outer hip to the inside of the knee with the pressure from the roller or ball. The “trigger points” or potent “buttons” to speed the release of Sartorius densities are in the upper third of the long, thin muscle. The Sartorius has been particularly difficult for me to calm but seems key to my knee health. Next, lie on your right side and roll the length of the outer thigh from the top of the hip to the knee. You can stack or not stack your left leg on top of the right for more or less pressure. You’ll be working on the most lateral quad and the notorious ITB (illiotibial band). 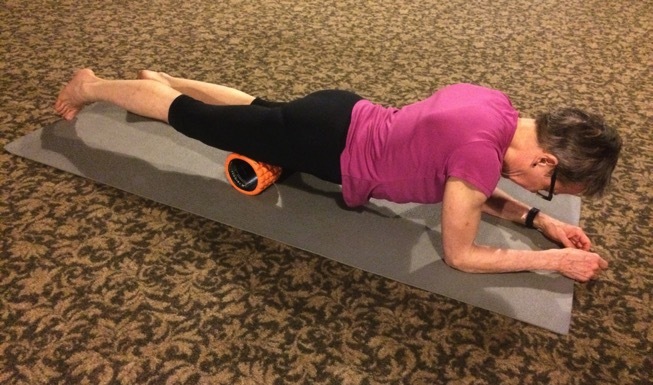 Rollers are a great way to introduce yourself to your own hot spots. Work with a roller until much of the pain and tenderness has been dispatched from an area. When you can tolerate working deeper in a resistant patch, use a softball in the same way as you did the roller. Unlike with the rollers, with balls you can scoop a little bit under big muscles and apply pressure from this new direction. Rather than briskly rolling back and forth, use a slow, pulling motion to stretch the tissues. Scar tissue in problem areas will gently tear apart with repeated pressure and a dragging motion with your chosen tool. However, the classic way to work is to apply steady downward pressure on a hot spot for 20 seconds and then move on. I use both the steady pressure and stretching technics. Sitting upright and applying downward pressure on to the ropes and bumps in your quads with a rolling pin is also an effective way to smooth out the tissues. 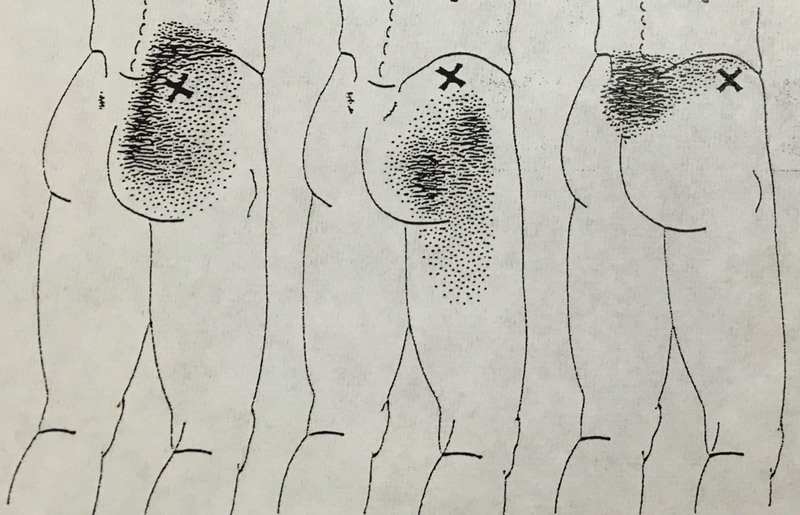 The “x” marks the location of the trigger points in the Gluteus medius, one of the “glutes” in the buttocks. The shading indicates indicates the broad area in which the given trigger point can create painful, referred, sensations. I often listen to music or TV to distract me from the pain while doing MFR to improve my endurance. At other times, I employ no distractions because I want to intensely feel and think about the anatomy of the area. Anatomy drawings online or in books and the above mentioned tablet app that allows you to peel back layers of muscle are extremely helpful for better understanding where the tugs and pulls are coming from in your tissues. I want to believe that my great progress with MFR could be made in less than half the time I have spent if a professional were doing the work but I don’t know how to find such a person. Likewise, there might be an ideal order in which to work, but I don’t know what that is. Instead, I roamed my body using a ball constantly feeling for hot spots. Looking at anatomy details gave me new ideas of where to work next and about interconnections between muscles but basically, I followed the sensations, looking for pain. I trusted that releasing any tension in my muscles and fascia would improve my body and since all of our tissues are linked by fascia, working on an ankle is likely to be of benefit to my knees or hips as well. The hamstrings, which comprise the majority of the muscle tissue on the back thigh, are often involved in knee problems though don’t seem to be an issue for me. I do however check-in with them using an easy technic from Starrett’s book. He recommends sitting on a wide box, placing a lacrosse ball between the hamstrings and the box, and smashing. I use a folding chair, which isn’t quite as good, to work-out the few lumps and bumps I find. Releasing kinks and knots in many muscles will benefit to your knees. I work on my calves while sitting on a pillow on the floor. I start with a foam roller under one calf and stacking the other lower leg on top of it for more pressure. When that no longer feels effective, I place a ball on a yoga block or book to elevate the ball and apply pressure to my calf muscles. Side lying with a ball under the outside (lateral) surface of my calves is very effective. Extra weight from the other leg can be helpful too. I’ll then bend 90 degrees at the hip and knee to roll the inside surfaces of the other lower and upper leg. I’ve also greatly benefited from smashing my ankles, both on the inside and outside surfaces. I use both a hard ball and a soft one because they seem to address different issues. Months after having obtained great releases in my ankle, I benefited from repeating the work because the soft tissue terrain had changed when densities released elsewhere in my lower legs. The firmness of a lacrosse ball and the height and firmness of a softball are great for tackling densities and knots in the buttocks. I work the buttocks from top to bottom and side to side. It’s very common for people to have lumps and bumps in this hard working tissue. The bilateral symmetry of our musculo-sketetal system can be exploited in your smashing ‘search and destroy’ mission. When you find hot spots on one side, check the same area on the other side of your body to determine if they are equally sensitive. Another great technic from “Becoming a Supple Leopard,” this time for the glutes. My first smashing project was my 40 year old ankle sprain residue. I went after it ferociously because I was certain the smashing was helping and it was. After a few aggressive sessions, I then did the same work on the other ankle to understand how the tissues would feel with a harsh ball when it was well. There was a marked difference, so I knew I had more work to do on the injured ankle. In contrast, the pain sensations when smashing the Sartorius muscle in each thigh were the same. I however knew that even though the sensations were quite similar, that they weren’t as healthy as they could be because they were painful and lumpy when I applied pressure to them. Unlike with my ankle however, the Sartorius muscles were likely dense from normal usage instead of a traumatic injury. Keep active over the weeks and months that you are smashing to support your knees. You are reshaping your muscles and fascia and you want your tissues to reorganize in a way that is compatible with how you actually use them. I believe that when I go hiking or biking that I’m extending my MFR treatment: my tissues get big releases with the work on the floor with the tools and the tugs and pulls are perpetuated while using the muscles in sports. And hyping-up the circulation during activity accelerates healing. The good news with smashing is that even when I whale on an area, it doesn’t seem to compromise its function. I can spend an hour or 2 smashing my low body and then head out for a big hike without any dysfunction—if anything is noticed is that my body moves more smoothly. I hope you are as dazzled by this do-it-yourself therapeutic approach as we have been and that you reclaim lost comfort and function in your knees. The article in this link http://www.triggerpointtherapist.com/blog/knee-pain-trigger-points/vastus-lateralis-trigger-points-quadriceps/ perfectly describes the tug-of-war I experienced between 2 of the 4 big quad muscles in mid-July 2016 that resulted in a lot of pain in the knee that was caught in the middle. My MFR work quickly revealed that both muscles were exceedingly irritated but this piece convinced me that I only needed to tackle the trigger points on 1 of the 2 muscles. In More Detail: I suddenly was unable to lock my left knee in standing. In the past, my massage therapist had said that that was not a knee joint problem but a protective mechanism when there was an issue with the muscles. Both the Vastus lateralis and Vastus medialis were fired up. I used the ITB trigger point position (top photo) to determine that it wasn’t an ITB issue. The illustration of referred pain in the above article was a perfect fit: the issue began with minor pain medially below the knee and progressed to pain in both muscles and the lateral side of the knee. Releasing both the upper and lower trigger points on the Vastus lateralis gave me an almost instantaneous,100% fix for my lost function and pain. Unlike her description, my problem was likely an overuse issue and not an abrupt injury.